When it comes to Chiranjeevi mass image there is no exception be it a small kid in Andhra Pradesh or Prime Minister of India. 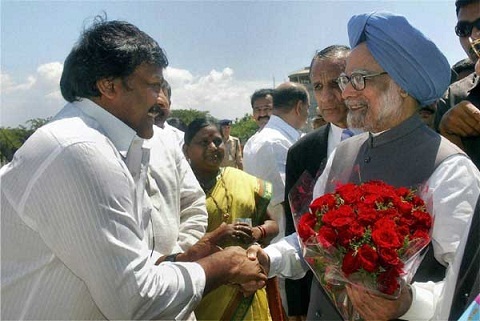 In the recent visit of Chiranjeevi to meet Prime Minister Manmohan Singh, our macho megastar witnessed an unprecedented surprise from Prime Minister. Generally Prime Minister Time is precious and no one get more than 5 or 10 minutes of the PM time. Even CM’s and other national leaders will get very less time. Chiranjeevi met Prime Minister as a courtesy call after meeting UPA Chair Person and AICC President Sonia Gandhi. The scheduled appointment is 15 minutes and the meeting went on for more than 30 minutes. Though the secretary of the Prime Minister is hinting PM about the delay in other appointments, he spared more time with Chiranjeevi. After the meet, Prime minister Manmohan Singh took the Autograph from our Megastar Chiranjeevi. Also during the discussions chiranjeevi mainly focused on giving national project status to Polavaram and Liquor problems in Andhra Pradesh. PM assured Chiranjeevi that he will do all the necessary work for the Polavaram project and he requested Chiranjeevi to start work on curbing the liquor sales and also asked him do an agitation on Liquor policy of the state government.